UPS being the worlds largest parcel delivery company, it is very easy to register with the Paypal for UPS shipping. Here we are going to explain the step by step procedure with each detail on how to register with Paypal for UPS shipping. 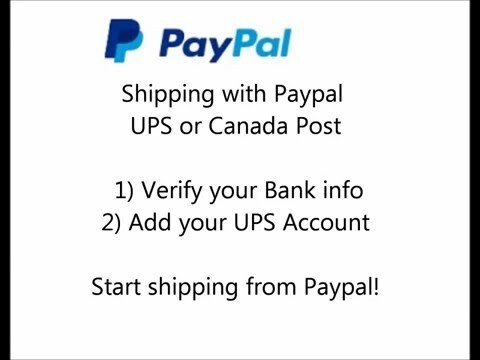 If you are the customer of the UPS shipping and didn’t register with Paypal then you can follow this post carefully in order to get connected to the UPS with paypal. PayPal provide a convenient, free and straightforward thanks to lookout of your shipping necessity with a range of useful shipping tools which are available without any hidden fees. After registering with Paypal for UPS, click the Print Shipping Label button on your Account summary or History page to access the shipping tools. Apart from UPS PayPal is also connected with the other services also like. U.S. Postal Service, Royal Mail Group and Canada Post and provide the shipping tools to all the above mentioned services. PayPal makes the sipping more easy and fun, all you have to do is select the carrier of your choice once your package is ready for the shipment. So, Sign up for PayPal to get more simplified shipping ways. below are the some of the advantages of using PayPal for shipping. You can make postage-paid labels for shipping in less than a minutes. You can easily pay for the insurance and shipping with the help of the paypal account without paying any monthly fees etc. You can also get a pre-filled packing slip and print them for your package. This slip contain all the date prefilled, all you have to do is just print it and use it. Apart form UPS tracking, paypal also provide the tracking service, so you can track your package with the paypal. You can Void your shipping label and obtained a refund for misprinted labels cancelled within 24 hours. These were the some of the advantages of using paypal for shipping . here is the step by step procedure to register with the paypal. follow these steps to get registered and start using the poaypal services for the UPS. Go to the paypal.com and fill the details to signup.if you already have the Paypal account then just sign with the paypal with your username and password. Click on the Seller preferences option under “Selling tools” on the left side of your account page. Click on the Add new or existing UPS account information option to connect your UPS account with the Paypal. if you are not registered with the UPS then first register with the UPS shipping. Enter an existing UPS account number or register for a new account with paypal. Click on the Continue to proceed. Recheck your information and proceed after by clicking on the continue. Click on the ‘I agree’ on the UPS Shipping Agreement to complete your registration with paypal. If you do not agree, your shipping registration will be cancelled. Now after this, you will get registered with Paypal for the UPS shipping. After following these steps, I am sure you all are ready to use Paypal for UPS shipping. If you have any query regarding the the post, you can comment in the comment box below.